The Malawi Orphan Fund is a UK based charity that both financially and prayerfully supports the Home of Hope childrens home, in Mchinji, Malawi. A Vocational Centre is currently being built to further prepare the children for an independent life. Here they will be gaining skills in technical and trade courses beyond the age of eighteen, enabling the students to gain the required expertise for employment following completion. Read more about Home of Hope here. In 2015 we resolved for there to be annual visits to Home of Hope by Malawi Orphan Fund to enable us to more effectively support its work. Most recently Jane Lambert visited in September 2018, for more information see our most recent newsletter. 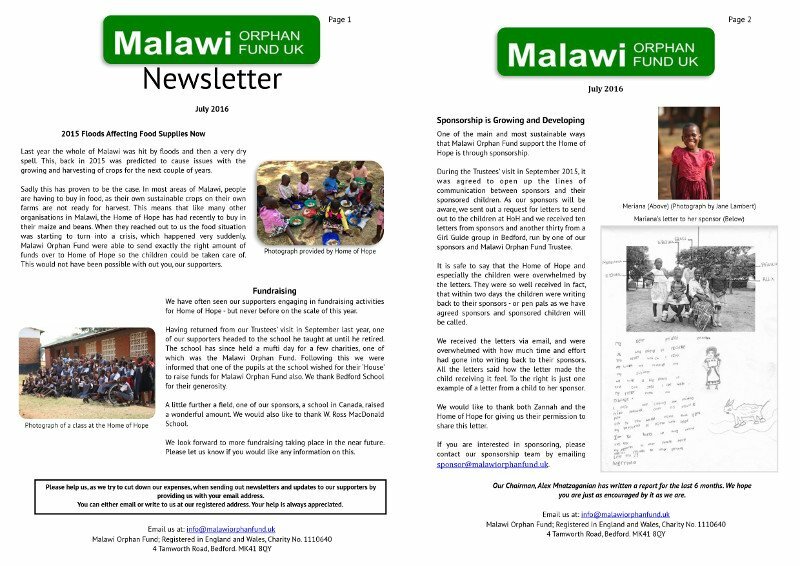 About twice a year, our supporters and sponsors receive a newsletter from the Malawi Orphan Fund, updating them on life at the Home of Hope. These also include information on sponsoring and how to stay in touch. You can see our most recent newsletter here by clicking the image. Where possible we prefer to send newsletters by email to reduce expenses, however we can send hard copies if you would prefer. Please email us at info@malawiorphanfund.uk or write to us at our registered address. We can also supply a set of newsletters for a church, community centre or an event - contact us as above. Check out Malawi Orphan Fund and Home of Hope on facebook. Home of Hope have an excellent blog with contributions by volunteers from all over the world and the Home of Hope management at homeofhopemalawi.org/blog. If you would like to unsubscribe please email us with your request at info@malawiorphanfund.uk.